The 3 little pigs have nothing on the 3 straw bale houses we visited yesterday. 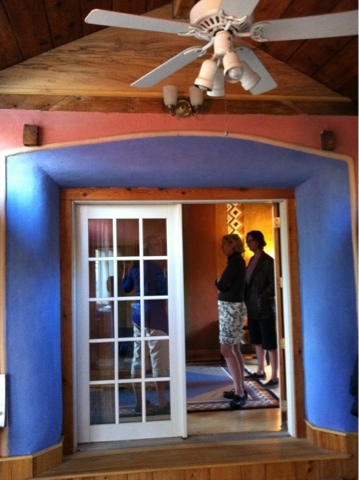 Part of the MD/DC/VA solar house tour...in which more than 50 homes are open over Saturday and Sunday...we selected the straw bale houses to see. The first one, with south facing glass, thermal mass floor, solar panels and a variety of other technologies, was a take your breath away kind of house. High ceilings, amazing wood work, cool showers. And the amazing walls that are rounded and soft, covered in a sort of clay that is completely finished, does not come off on you. 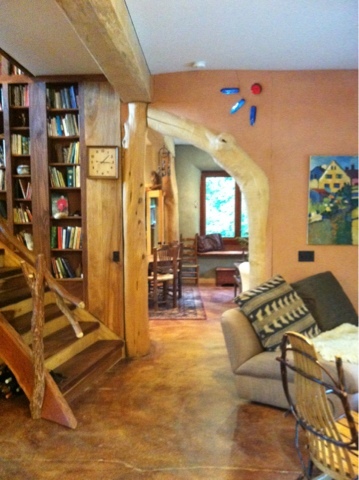 Cob construction, use of wood from the property, at about 3,000 square feet a spacious, lovely home. 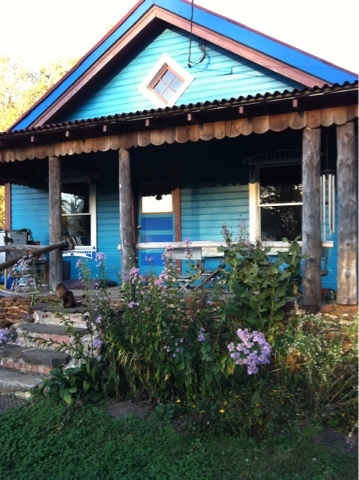 The next straw bale house we had seen before, 6 or 7 years ago, when it had just had an addition installed. Many more parts are finished, and it is a beautiful and livable space, amazing finishes. On this property is another structure, used as a guest house, and just the size Homer and I wanted to see. If we are to build a cob house in our lifetime it will need to be well under 1,000 square feet, be passive solar, small but detailed. This house was just the one, after seeing the other 2, to get our brains going: while we have a house here, we are ready to have a smaller something, an efficient something, we are just not certain what yet. The 3 little pigs runs on my mind: I'll huff and puff and blow your house down! I grew up in a brick house, every house I've owned (except for here on the farm) has been brick, so stacking hay bales tight, covering with breathable material and the living in it is still a bit of a head scratcher for me. Straw. Rewnewable, grows all over here...3 cuttings this year! Clay is just below the top soil here and is what bricks are made of. We have a patch of woods, and have friends who let is know when homes are dismantled, and get wood for us. Could we build a house for cost of roof, concrete, fixtures and appliances? It is all still swirling around, but this idea seems more and more feasible. The photos are from 3 different structures, each amazing. And wonderful that people open their homes and let us tromp through! Best learning ever.